Sportmix CanineX Grain Free Dog Food provides the nutrition active dogs need for sustained energy, maximum muscle function and sharp mental focus. 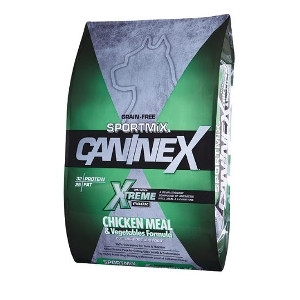 CanineX features protein-rich chicken meal, egg and vitamin packed fruits and vegetables. Xtreme Pack, a combination of Antarctic krill meal and L-carnitine supports the health of several vital organs, including the heart, kidney, liver, joints, brain, eyes, skin and coat. Grain-free, gluten-free and made without corn, wheat, soy or by-products.